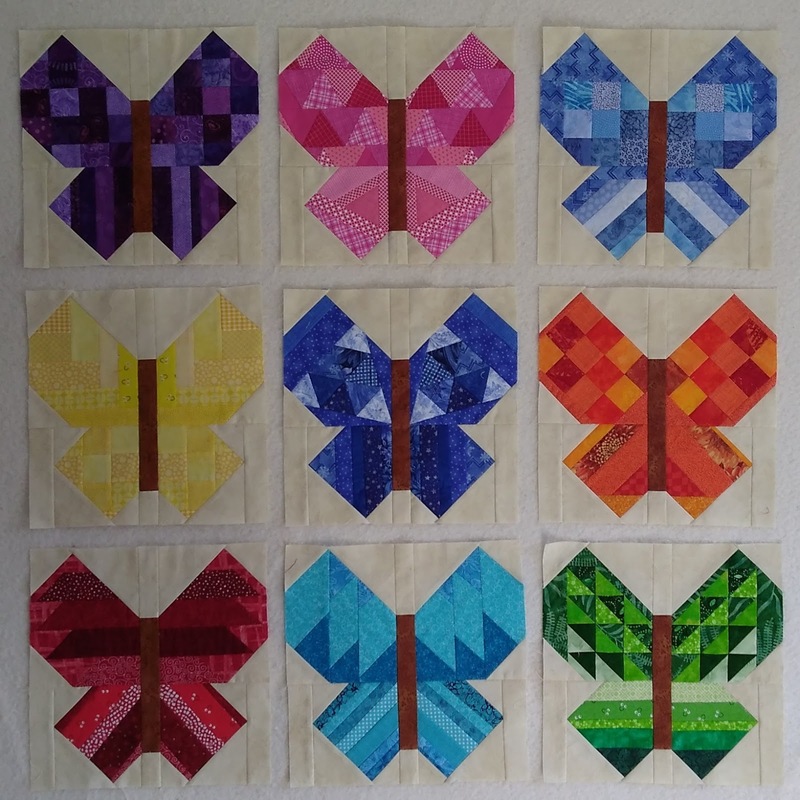 October's butterfly block for the Rainbow Scrap Challenge is done! The colour this month is pink. I'm glad this is about scraps, because I didn't have many big bits of pink to work with. I reached for the 60 degree triangle ruler for this one. The upper wings are just rows of little 2" tall triangles. The lower wings are a log cabin style block built around a triangle instead of a square. Looking at this one I wish I had played more with the lower wings in the rest of my butterflies. Not enough to want to remake any though! When I started making these in January I shared two layouts I was considering. Of course the more time passes between the idea and the execution, the less likely I am to use the original idea. 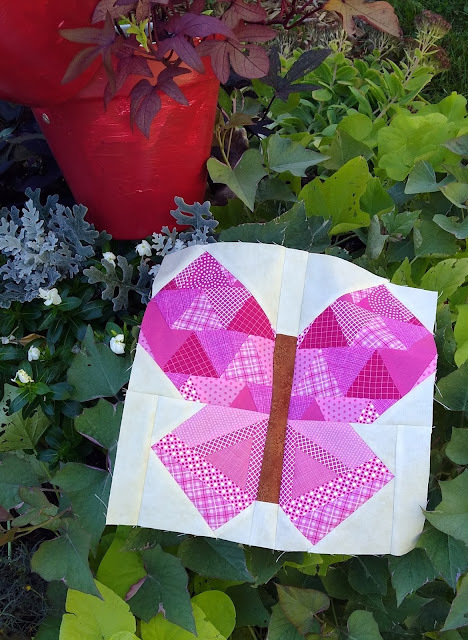 When I decided I'd stop at 9 blocks, I tweaked things a bit, adding a few Spring Blooms blocks. By the time I finished the last block on Monday, I wasn't sure about the blooms idea and I went back into EQ and tweaked things again. Here's the final layout...unless there is too long a gap between now and when I actually assemble the top, in which case I might change my mind again. I have enough background fabric but not enough green so this weekend I'm shifting to finishing up a few things. I really want to cut into my Anne of Green Gables fabrics, but I'm saving those as a reward for tackling the short list above. We'll see how I do! That's a lovely pink butterfly Joanne. I especially like the triangle log cabin blocks and how your butterflies are fluttering across the quilt in your layout. Glad to see that someone is making progress on their short list. My *short* list just keeps getting longer! Congrats! on completing your PINK butterfly. I like all 2 of the proposed layouts. No matter how you lay it out, the quilt is going to be stunning!! I have thoroughly enjoyed seeing how you switch up the pattern on the leaves of each butterfly. This one blows me away! Beautiful butterflies, and beautiful layout! Wish I had a bit of your creativity, and your energy too! ---"Love"
Your butterflies are so pretty and I love your quilt design! Love your butterflies. I am looking forward to seeing the finish! SO much quilty goodness going on at your place! The butterflies are beautiful just as they are! Great layout idea for the butterflies! Whatever you do with that butterfly quit, it will be pretty with those butterflies. I like your grown-up Starlight Wishes. All good stuff! I like the flutter in the on-point setting, with the butterflies flitting in different directions. Nine is a good number! I love the fluttering effect in that setting, too! I've enjoyed seeing you make the lovelies! That setting seems just right for the nine, lots,of air space around also. They really see to fly. I do prefer the darker yellow in your mockup. Amazing that each one is patched differently, very creative. You must have had lots of fun with them. I really like this pink butterfly. And the setting you've created will make for a wonderful quilt! I agree with PaulaB Quilts! Such a pretty layout. Good luck accomplishing everything on your list! Your butterflies are so pretty. 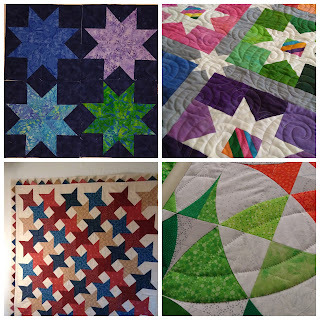 Like the quilt layout too. Your butterflies are all so pretty! A darker yellow would probably look better with the other colors but this yellow one is pretty, too. I like the butterflies on point, makes a very interesting setting. Hope you got your short list done so you can start playing with the Anne of Green Gables fabrics. Sounds like fun! Very pretty butterfly's! love your setting. So much progress on lots of fronts. Great job. Oooh, very pretty! I love all the different ways of piecing the wings. It's going to be a gorgeous finish. Oh I really like the layout, hope that is how it stays! Good call on the two blues.